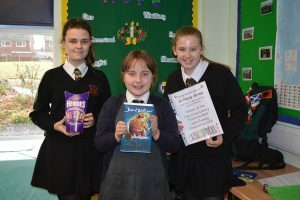 Miss Rushton visited St. Mary’s Catholic School with two Library Assistants (Keira in Year 9 and Sophie in Year 10) to present a prize to one lucky pupil. During open evening a competition was held in the library – we asked visiting pupils to tell us about their favourite book to be in with a chance to win a copy of the new release by David Walliams and a box of chocolates. Every year this competition is really popular and there were over 100 entries, but one winner had to be chosen…..congratulations to Bethany Grime in Year 5 at St. Mary’s. Bethany was delighted to be presented with the prize and a certificate in class. Well done and thank you to everyone that entered our competition. At Holy Cross our KS3 pupils embrace reading for pleasure by taking part in the Accelerated Reader scheme. We think this is a great way to introduce Accelerated Reader to potential new pupils and celebrate a love of books.